Pomelos were prevalent in local markets during the winter. And so, after seeing them in Chinatown groceries over the years, and hearing that they were something like a less-acidic grapefruit, I finally got around to picking up a couple. Looking much like an overgrown grapefruit, the pomelo is indeed like a milder version of that citrus. A little research on the fruit and its uses turned up that it is native to South Asia (hence its regular appearance in Chinatown), is available in white- and pink-fleshed varieties, has a remarkably thick skin and layer of pith, is also known as the shaddock or pamplemousse – and, that it was the base of Forbidden Fruit, a mysterious, long-vanished liqueur, and a key ingredient of the Dorchester Cocktail. OK, that part got our attention. Delicious as the pomelo fruit is all on its own, dripping with the taste of honeyed grapefruit, its connection to the Golden Age of cocktails made it even more alluring. 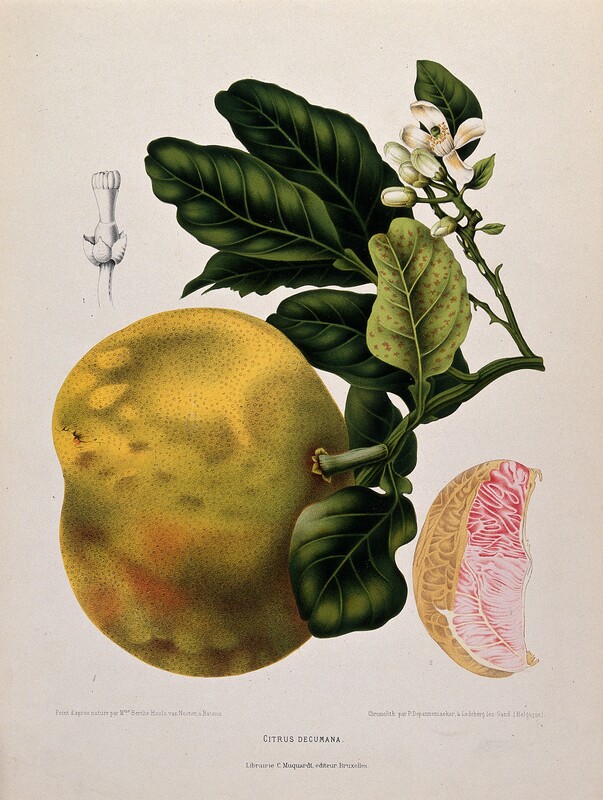 The whims of the 20th-century pomelo market probably brought about the demise of Forbidden Fruit liqueur, which was made by the same producer as Chambord, and was even sold in the same globe-shaped, gold-capped bottle. Even London’s Dorchester Hotel is left to wonder what might have been for its signature drink. Pomelos are still a rarity in most markets, but apparently California growers have been experimenting with the crop. Its emergence in this country dovetails with the craft cocktail movement, and mixologists have set their sights on recreating Forbidden Fruit. Collectors have been seeking old bottle of the commercial product on eBay, hoping to coax out a few remaining drops or vapors to analyze. Cobbling together some of those efforts, we blended a batch by steeping the juice and peels of pink pomelos and blood oranges, plus cardamom, coriander and vanilla bean, in cognac, then straining off the solids and adding orange blossom honey. The resulting liqueur has am amber color and nectar-like fragrance of early spring blossoms, touched with jasmine, vanilla and honey, tempered by a back note of spice. It’s beautiful to sip on its own, and the classic Dorchester Cocktail, which employs gin, rum and Forbidden Fruit, is a lovely martini variant. Cocktail lovers, take note. Everyone else, just cut into a pomelo to understand this enchanting forbidden fruit. Stir with ice, strain into a chilled cocktail glass and top with a twist of lemon.